Gorgeous, juicy berries, picked fresh from your own garden. Enjoy home-grown, fresh berries, picked straight from your garden. A plentiful supply of juicy sweet berries from late July into October. Beautiful white summertime blossom which provide a nectar feast for all friendly insects. Vigorous, easy-to-grow and fully hardy to withstand the worst of winter cold. Delivered as 3 x established plants (1 of each variety, Blackberry, Loganberry and Tayberry) in a 9cm pot, ready for planting out to final position. A mixture of delicious 'hybrid berries' and the good old English blackberry, this collection of soft fruits will give outstanding results and a plentiful supply of juicy berries from late July into October. With a vigorous, rambling nature these berries will need support to get the best from them, and they make ideal plants to grow up a trellis or along walls, where their stunning early summer blossom provides a welcome source of nectar for all friendly pollinating insects. To enjoy the berries at their sweetest be patient and pick them when they are fully coloured and perfectly ripe, they're lovely eaten fresh and all of the varieties in this collection will make lovely preserves too. Fully hardy and able to withstand the worst of winter cold, the plants are vigorous and do need space to thrive, so allow 2-4m between plants and you'll enjoy bounteous yields every year. One of the early so called 'hybrid berries' resulting from a raspberry x blackberry cross, Loganberries are a splendid plant to train along a wall or trellis. Producing juicy sweet berries from August to October, Loganberries have an aromatic tang and fruit which are larger and longer that it's raspberry parent. 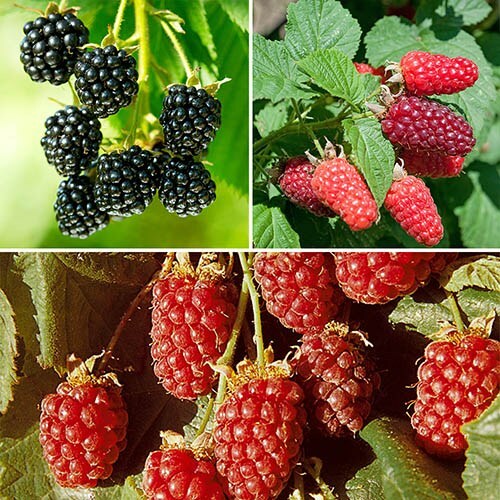 The splendid tayberry is a hybrid plant resulting from a cross between raspberries and blackberries and bear some resemblance to both its parents. The deep red fruit resemble large blackberries but are sweeter and more aromatic. Enjoy the exceptional taste of homegrown blackberries without the hassle of thorns. A compact and thornless variety, you'll be easily picking the bumper harvest of large berries from late July. Cane fruits have shallow root systems, so make sure that all competing weeds are removed. Do not plant near wild brambles or where tomatoes, peppers or potatoes have been grown to reduce the risk of virus diseases. Dig a hole wide enought to accomodate the roots and set the plant at the same level as it was in the pot. Water plants well until established. Blackberries/Loganberries - During autumn or winter each year remove canes that have fruited to ground level and train and tie in the new growth that has grown up from the base during the summer. In late spring cut out the tips of the leading canes to promote the growth of more fruiting laterals. Tayberry Autumn-fruiting (Primocane) varieties fruit on canes produced in the current year. After cropping, these should be cut down to ground level to promote the growth of new canes.